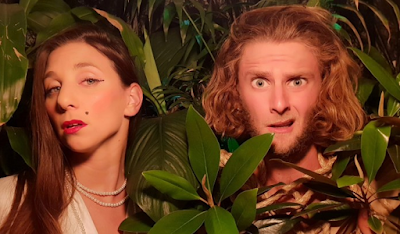 Comedy duo Chelsea Zeller and Samuel Russo return to the Melbourne International Comedy Festival with their new show, Mrs. Robinson Crusoe, a time-travelling romp of sketch comedy spanning 70 years. It is 1950 and Betty Robinson, a wealthy socialite on a cruise, bumps into James, the 18-year-old (19 in March) son of her friends. Their romance is passionate but brief as the ship is involved in an accident with Mrs Robinson thrown overboard and waking up on a deserted island, or so she thinks. Through times' trickery, Mrs Robinson has somehow ended up in the future, on an island where Survivor is being filmed. In one scene she finds a washed up bag with a number of curiosities, such as an iPad that she assumes is a serving platter and mistaking another item as a fancy drinking cup that you definitely do not want to be putting anywhere near your lips. While this is happening, Zeller and Russo also play several Survivor contestants taking the tropes and characters from the TV game show and turning the dial up on them. Zeller and Russo excel in their characters and it is evident they are having fun with them, particularly of twins Persephone and Serpephone. There are clear and subtle differences in each of their characters in the way they speak,their body language and how they interact with each other (and the audience). Where Mrs Robinson Crusoe loses its momentum is that the two "narratives" don't seem to have anything to do with each other and nor do they eventually come together. The show ends up being a loose sketch comedy- which is perfectly fine - but finding that one scene to link the two disparate stories together would have been very rewarding for the audience. The two use a minimal number of props and the low-budget aesthetic they employ adds to the appeal of the show. A miserable looking blow up palm tree signifies the arrival on the island; a tacky pearl necklace is used to represent Mrs Robinson. We even get a badly played version of "My Heart Will Go On" on the recorder. However, it would have been nice to see some effort in the clothing the two wear on stage. Shorts and a t-shirt might be suitable for stand up, but for this show, even some kind of island or beach themed styling would have gone a long way in visualising the environment that we are being presented with. Mrs Robinson Crusoe might be a little rough around the edges, but the enthusiasm and performances from Zeller and Russo keep this ship afloat. It is a light-hearted frolic in finding a happy medium between a nostalgic era and the cut-throat nature of modern day living. Click here for my interview with Chelsea and Samuel.